Additional previous work is discussed below those themes. The proliferation of international institutions with overlapping scope and authority over issue areas creates strategic dilemmas for all states. 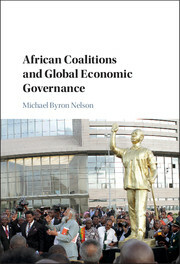 While African states are often considered marginalised in world politics and global markets, Michael Byron Nelson shows how coalitions can form a crucial part of African strategies to influence international institutions and achieve results. Building a bottom-up analysis of global governance, through legal analysis, content analysis, and in-depth interviews, Nelson illuminates institutional and coalition dynamics through case studies of three key areas – food safety, intellectual property, and agricultural trade. He highlights the difficulties encountered by coalitions attempting to navigate institutional systems, emerging from institutional thickness (increasing the number of institutions involved) and integration (increasing the formal linkages between those institutions). Finally, Nelson shows how increasing the hierarchy of an institutional system, by creating a focal point on a single institution, can make coordination easier for coalitions. Africa’s Regional Powers and Climate Change Negotiations. May 2016, Vol. 16, No. 2, Pages 110-129. This project is animated by a basic observation. States—especially small states—cannot afford to participate in all of the meetings held by all international organizations. So how do they decide when and where they will send delegates? This study is the first systematic attempt to examine that question. When doing my initial research for the book I began constructing a dataset on state participation in international organizations. That dataset included coding of meeting attendance and text analysis of meeting minutes coded for a variety of factors including voice (how often do delegates speak) and importance (how often are individual countries mentioned in the minutes as an object of attention). Since 2011 I have worked with student interns to rebuild and expand my initial dataset. The purpose of this data collection was to provide data on the participation of countries in the meetings of international organizations during the most recent decades. Data was taken primarily from official meeting reports, meeting minutes, and lists of participants and delegates as obtained through the websites of the international organizations. Variables include the date countries joined the organizations, the number of participants at meetings of the international organizations, the job title of the representatives sent to the meetings, the number of times countries are mentioned in meeting records, and the number of times country delegates are recorded as speaking during meetings. Currently the dataset includes data on the Codex Alimentarius Commission, the UN Food and Agriculture Organization, the World Health Organization, the World Intellectual Property Organization, the World Organization for Animal Health (OIE), and several parts of the World Trade Organization (the WTO Sanitary and Phytosanitary Standards Committee and the WTO Council for Trade-Related Aspects of Intellectual Property Rights). Under what conditions do African states take action on international environmental agreements? African states regularly sign, ratify, and even withdraw form multilateral, regional and bilateral environmental agreements.This study assesses a range of explanations for these patterns of action including the type of environmental issues, the varying capacities of states, and linkages to economic and political issues. I have three goals in writing this book. The first is to discern the major empirical patterns of West Africa’s international relations and how they have changed over time. This in itself should be an important contribution, as such sub-regional analysis is rare. The second is to bring us to a better understanding of the boundaries of contemporary international relations theory. As a number of scholars have noted, state behavior on the African continent appears to challenge our conventional theories. Most analyses of international relations begin with a focus on the world’s major powers, such as the US, EU, Russia, and China. But what do global politics look like from the position of states that are at the bottom? Why is there less war between states and more war within states than we have seen in other parts of the world during processes of state formation? A major argument I make in this manuscript is that focusing on a region where the nature of the primary units of the system (the nature of West African states) are in such flux can give us unique insights into both the strengths and limits of mainstream theoretical approaches. Finally, what are West Africa’s prospects for the future? Where is the region headed and what is its likely future place in the world? Emerging powers must frequently balance their domestic priorities with their regional and global leadership aspirations. This paper explores South Africa’s balancing attempts during multilateral negotiations about climate change and trade. South Africa has clearly attempted to stake a leadership role in each of these areas. On climate change, it played host to the Durban Conference of Parties meeting in 2011 and has attempted active leadership both on behalf of the African continent and in conjunction with its membership in the BASIC (Brazil-South Africa-India-China) coalition. In WTO trade negotiations over the last 15 years, South Africa often promotes its role in supporting an African agenda and the interests of developing countries more generally. In both of these areas, however, South Africa must often confront the fact that it is not like its other developing country and global partners; its own national interests often run counter to the goals of those coalitional partners. Abstract: Over the last 15 years, the African continent has undergone a telecommunications revolution, with hundreds of millions of Africans newly connected to each other and the rest of the world. How is this connected to China’s rising engagement with the continent? What are the political implications? Chinese firms, with the assistance of China’s financial institutions and diplomatic institutions, have successfully secured contracts to build infrastructure, supply equipment, and wire Africa for the 21st century. We focus on the activities of Chinese state-owned and quasi-private telecommunications equipment makers and service providers in Angola and Nigeria. We find these firms have played a vital role in shaping the timing and pace of telecommunications expansion in those countries. We also find they provide important political opportunities and challenges for African governments and politicians. What is the increasing role of the BRICS in Angola and what significance does this have for US attempts to build a strategic partnership with that country? This paper emphasizes the role of China, while acknowledging that Brazil, India and South Africa are also playing important roles. Several finding include the focus of BRICS interventions on infrastructure development and the general lack of US investment in this area; the existence of common BRICS-US interests in Angola, including political stability; and that the BRICS currently have an advantage over the US in engaging the lusophone world more generally. African Hydropower: Does China’s involvement make a difference? Are Chinese hydropower projects in Africa more or less damaging to the environment and to state-building in Africa than their Western predecessors? Is it the case that China, as many of its leaders promise, can provide a more positive model for African states since it too is a “developing country”? This paper explores these questions in the context of the Bui Hydropower Project in Ghana. Abstract: Is the analysis of patron–client networks still important to the understanding of developing country politics or has it now been overtaken by a focus on ‘social capital’? Drawing on seventeen country studies of the political environment for livestock policy in poor countries, this article concludes that although the nature of patronage has changed significantly, it remains highly relevant to the ways peasant interests are treated. Peasant populations were found either to have no clear connection to their political leaders or to be controlled by political clientage. Furthermore, communities ‘free’ of patron–client ties to the centre generally are not better represented by political associations but instead receive fewer benefits from the state. Nonetheless, patterns of clientage are different from what they were forty years ago. First, patronage chains today often have a global reach, through trade, bilateral donor governments and international NGOs. Second, the resources that fuel political clientage today are less monopolistic and less adequate to the task of purchasing peasant political loyalty. Thus the bonds of patronage are less tight than they were historically. Third, it follows from the preceding point and the greater diversity of patrons operating today that elite conflicts are much more likely to create spaces in which peasant interests can eventually be aggregated into autonomous associations with independent political significance in the national polity. NGOs are playing an important role in opening up this political space although at the moment, they most often act like a new type of patron. International Rules, Food Safety, and the Poor Developing Country Livestock Producer. 2005. PPLPI Working Paper No. 25. Rome: FAO. This study is a part of the PPLPI effort to identify significant political and institutional factors and processes that currently hinder or prevent the poor in developing countries from taking greater advantage of opportunities to benefit from their livestock resources. The rapid development of international sanitary and phytosanitary standards have been identified as an important factor and further research is needed in this area. This study focuses on what can be done to make international rule-making friendlier to poor livestock producer interests. To identify strategic entry points for those wishing to make international rule-making friendlier to poor livestock producers this study: (a) describes and analyzes the international environment that states and other actors face when seeking to influence international food safety rules; (b) discusses the roles played by states and other actors in creating and enforcing those rules; and (c) analyzes a series of cases involving international rule-making for livestock food products. Recommendations for making international rule-making friendlier to poor producers consider two perspectives: that of the producer and that of the national delegates participating in the international rule-making process. From the perspective of poor producers and their advocates the primary route to influencing international rule-making is by influencing their own country’s position in international organizations. However, developing country governments are not yet taking full advantage of the options for representing their own interests in international rule-making. Important activities they should engage in include: greater coordination at the national level among ministries and individuals responsible for developing policy positions in all international food safety organizations; improving the quality and quantity of delegations to international organizations; forming alliances with other similarly-situated countries on issues of particular concern; and lobbying for technical assistance to comply with international standards and with a goal of complying with private international standards as well. In general, the study concludes that developing countries can do much more to address the interests of their poor producers. with Michael Halderman. 2005. PPLPI Working Paper No. 18. Rome: FAO. The present study is part of the PPLPI effort to identify significant political and institutional factors and processes that currently hinder or prevent the poor in developing countries from taking greater advantage of opportunities to benefit from livestock. The study examines the political economy of policy-making concerning trade in livestock and livestock products (LLPs) between the European Union (EU) and developing countries (DCs). The main objective is to determine and assess how relevant EU policy is made, including the role of key actors and forces both domestic and international. The political economy of relevant LLP trade-related issues are examined at four levels: (a) the EU member state, (b) the European Union itself, (c) the international trading system, and (d) developing countries. Several issues cross, or are relevant to, the different levels of analysis. A related objective is to identify “entry points” and provide strategic recommendations aimed at achieving positive change. Two livestock commodities, beef and dairy, were selected as central to the study. The EU is a prodigious producer of livestock and livestock products, and it plays a major role in international trade in LLPs. EU subsidies and trade barriers have been the subject of intense criticism by some European Union member states, developed and developing country trading partners, international organizations, academics, advocacy NGOs and others. Michael Halderman, Independent Consultant, Berkeley; and Michael Nelson, Political Science Doctoral Candidate, University of California, Berkeley. Institute of European Studies. Paper 1. October 20, 2004. This study analyzes the political economy of European Union policy-making in regard to EU trade in beef and dairy with developing countries. The way the EU makes its agriculture and trade policies involves three levels: the EU member state, the EU itself, and the international trading system. The study also considers a fourth “level,” developing countries, that is affected by EU policy-making. We present criticism from various sources concerning negative international effects of EU agriculture and trade policies. Recognizing the great range of trade-related interests among developing countries, the study analyzes relevant issues of four categories of such countries. EU trade and agriculture policy is strongly influenced by international factors, particularly by multilateral trade negotiations. Change in relevant EU agriculture and trade policy affecting developing countries has been part of or directly linked to – and in the future will require additional reform of – the EU’s Common Agricultural Policy (CAP). Recent reform of the CAP has been affected by and linked to the current Doha Round of multilateral trade negotiations conducted under the auspices of the WTO.